- Clean towels and sheets. 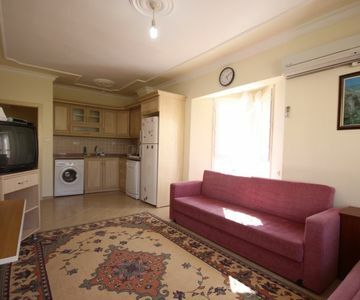 It is situated in Kavkar Holiday Village, at 5 minutes of driving distance to the sea, at 2,5 km distance to Altinkum. In 1 bedroom is a double bed, in the 2. bedroom 2 single beds, a double sofa bed in the living room. The holiday village is situated on the coastal road, Efeler Quartier, at about 5 minutes by walking to Migros supermarker, at 5 minutes by driving to the marina, at 1 km to the antique city of Didim, at 2,5 km to Altinkum, at 15 km to Akbuk. The holiday village has a pool and Didim has many unspoiled beaches, especially in the Akbuk Bay. Electricity and water costs are not price included.